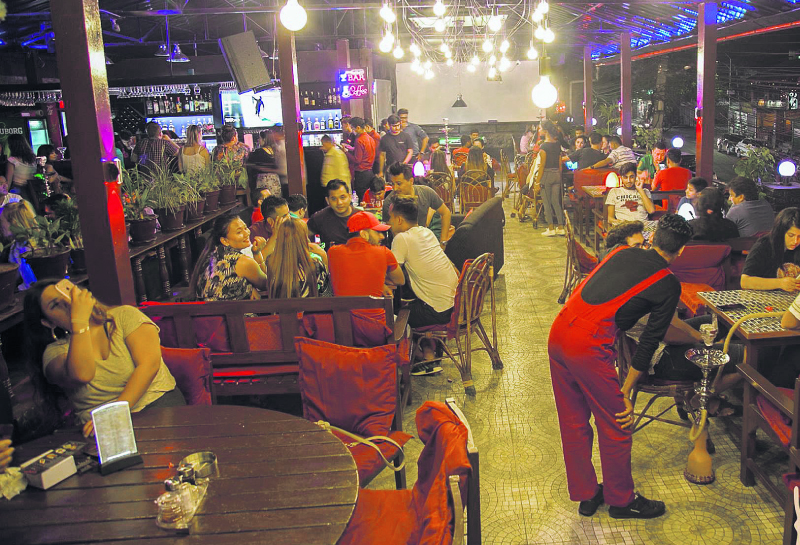 Businesses like Koyla Lounge have been attracting more Arabians to Pokhara. Tourists from Dubai, Qatar, Iran, among other gulf states, have been coming here in huge numbers of late. POKHARA, July 4: A few months ago, a different type of restaurant opened in Lakeside of Pokhara. It was later known that the restaurant, Koyla Lounge, had landed here after doing brisk business in China and Dubai. And its target in Pokhara was the same - Arabian people. Even though it offers other cuisines, its specialty is Arabian cuisines. After seeing that Pokhara was receiving substantial numbers of tourists from Arabian countries, Koyla decided to expand its business here, too. The restaurant's manager Krishna Bastola, said that Arabian guests feel at home when they are at their restaurant. Arabians feel more attracted to the restaurant because elsewhere they hardly get their choice of food, Bastola claimed. “Our main guests are Arabians. However, we have been receiving other local and international guests. People from Europe, America, and India have graced us with their presence and tasted our cuisines. They are full of praise,” he claimed. “We are seeing great flow of Arabian tourists in Pokhara these days. We started this restaurant with an objective to tap into the influx of Arabian tourists as there were no restaurants for them here around,” he added. Bastola boasts of quality service at the restaurant. He states that Arabians do not compromise on quality. “We are committed to serving quality items with quality service. That's the reason we have been able to keep them happy,” he stated. Most of the tourists from Arabia are Muslims. And they strictly go for halal meat. Normally, they do not get halal meat in restaurants and hotels. So, they find it very difficult to prolong their stay in Nepal, Bastola said. “But when they realized that there is a special restaurant for them which serves several Arabian cuisines including halal meat, they feel relieved. They can stay here for as many days as they want and enjoy their vacation,” he stated. Apart from them, tourists from even other nations love to taste Arabian food. “We do get guests from many nations. For some, it is only for a change of taste,” Bastola said. Bastola further said that Arabian tourists, when they do not get halal meat, compromise with egg and fish. No matter how much they want to eat meat, they do not try it until and unless they make sure it's halal meat. Since they are very strict about their meals, the restaurant has appointed special workers. “We have very trained staffs, chefs here. We respect their choice. We love to give them the best food with best service,” he said. Other restaurants are now following Koyla's footsteps. Considering the good flow of Arabians in Pokhara, more restaurants are offering halal meat, among other Arabic cuisines. Bastola said that even though Koyla opened in Pokhara seeing good prospects of serving Arabian tourists, the restaurant itself has now become a major attraction for Arabian tourists. “When you know that the place you are going serve your nation's cuisines, you are more willing to come and stay. Considering the fact that Koyla now offers this home-coming-feeling to Arabian tourists, we might be adding a good reason for the Arabian tourists arrival here,” he said. Rajkumar KC, a local entrepreneur, agrees to Bastola's assertion. He claimed that earlier Arabian tourists could be hardly found in the city. But in the last few months, they are more visible. “Businesses like Koyla Lounge have been attracting more Arabians to Pokhara. Tourists from Dubai, Qatar, Iran, among other gulf states, have been coming here in huge numbers of late,” he stated. He added that the tourists from Arabia come with friends and families rather than single. “If we could draw more Arabian people, this could do wonders in boosting our tourism industry,” he added. Former chairperson of Restaurant and Bar Association of Nepal, Gopi Bahadur Bhattarai remarked that the flow of Arabian tourists have added different flavor to tourism. “A few days ago, my restaurant was full of Arabian guests. That was an exciting moment,” he said. He added that more of Arabian-centric facilities have to be added so that the country could attract more Arabian tourists. Bhattarai terms Arabians as precious guests claiming that they spend lavishly. There is a need to advertise lot more about our services in the Arabian countries. This could help Nepal become a famous tourist destination among gulf nation citizens.